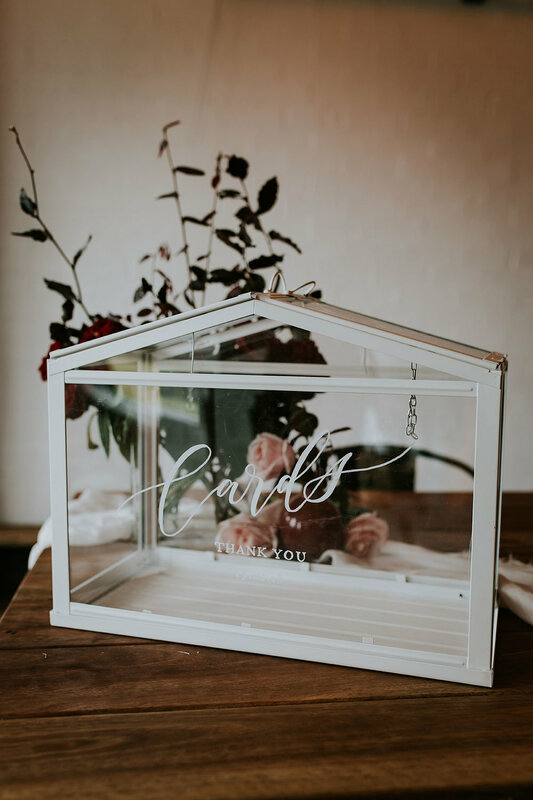 The Hire Store — Better Together Paper Co.
We have collected and custom built a range of curated items to help elevate your wedding day. Please complete the enquiry form at the bottom of this page with a list of the items you’re interested in hiring along with the quantity per item. White metal frame with perspex windows. Hire includes personalised white lettering. Unstained timber easels with adjustable base. White coated easel with adjustable base. Florals not included in hire. Hire cost includes digitally printed table number/menu/sign. Clear acrylic with gold vinyl script numbers. Wooden block hired separately. Clear acrylic with white ink printed table numbers. Clear acrylic with black ink printed table numbers. Can either be lent on the table as pictured, or sat in our small wooden blocks (coming soon). Perfect for table numbers, menus and other small reception signage. Hire cost is for the blocks only. Clear plastic blocks for holding table numbers, bar menus and other smaller reception signage. Stunning apparatus for hanging your welcome sign and seating chart. Need signage or stationery to match our hire items? If you are ordering custom stationery/signage with Better Together, there is no minimum hire cost. If you are sourcing your own stationery/signage, and just want to hire from the list above, the minimum spend is $100 (ex. delivery fees). All items are available for hire on the Central Coast, Sydney and surrounds (sorry we don't ship overseas). We also do not sell these items. Pick up needs to be organised from our West Pennant Hills or Central Coast studios (some items available at only one location). If we are available to deliver and set up your items, there will be an additional fee based on event location, day, time and hire items. Hire items will be sent via trackable express post with Australia Post or TNT. The cost for shipping is based on the size/weight of your hire items and your location. For example, 10 Table Numbers with holders could be around $20-$30 where as the Hanging Apparatus would be around $50-$60 due to the length of the box. Please complete the below enquiry form with a list of the items you’re interested in hiring along with the quantity per item. If you require additional information on an item, please don't hesitate to contact us. If you're wanting to pick up your items - when do you wish to pick-up your items? Eg. June 15th, between 10am–1pm. If you need us to post your items (if possible) - when do you need them by, and where will they be delivered to? Eg. Thursday the 15th of June, by EOD. Event location and address. Eg. 2x Small Clear Block Holders. 1x Gold Hanging Aparatus. Thank you for your enquiry! We will be in touch soon to confirm your hire order and work out the finer details.